Johari, M., Hosseini Motlagh, S., Nematollahi, M. (2016). Coordinating pricing and periodic review replenishment decisions in a two-echelon supply chain using quantity discount contract. Journal of Industrial Engineering and Management Studies, 3(2), 58-87. M. Johari; S.M. Hosseini Motlagh; M.R. Nematollahi. "Coordinating pricing and periodic review replenishment decisions in a two-echelon supply chain using quantity discount contract". 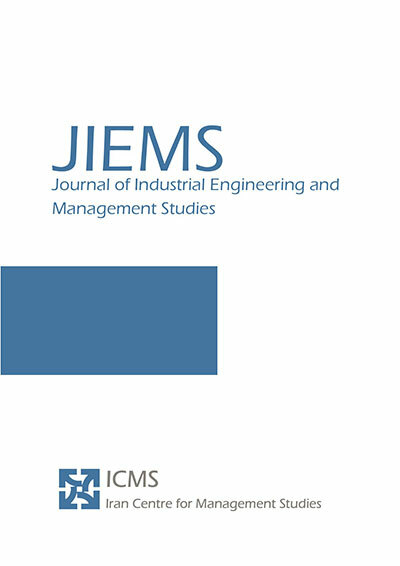 Journal of Industrial Engineering and Management Studies, 3, 2, 2016, 58-87. Johari, M., Hosseini Motlagh, S., Nematollahi, M. (2016). 'Coordinating pricing and periodic review replenishment decisions in a two-echelon supply chain using quantity discount contract', Journal of Industrial Engineering and Management Studies, 3(2), pp. 58-87. Johari, M., Hosseini Motlagh, S., Nematollahi, M. Coordinating pricing and periodic review replenishment decisions in a two-echelon supply chain using quantity discount contract. Journal of Industrial Engineering and Management Studies, 2016; 3(2): 58-87. 1School of Industrial Engineering, University of Science & Technology, Tehran, Iran. 2School of Industrial Engineering, Iran University of Science &amp; Technology, Tehran, Iran. In this paper, the coordination of pricing and periodic review inventory decisions in a supplier-retailer supply chain (SC) is proposed. In the investigated SC, the retailer faces a stochastic price dependent demand and determines the review period, order-up-to-level, and retail price. On the other hand, the supplier decides on the replenishment multiplier. Firstly, the decentralized and centralized decision making models are established. Afterwards, a quantity discount contract as an incentive scheme is developed to coordinate the pricing and periodic review replenishment decisions simultaneously. The minimum and maximum discount factors, which are acceptable to both SC members, are determined. In addition, a set of numerical examples is conducted to demonstrate the performance of the proposed coordination model. The results demonstrate that the proposed coordination mechanism can improve the profitability of SC along with both the SC members in comparison with the decentralized model. In addition, the results revealed that the proposed incentive scheme is able to achieve channel coordination. Moreover, the coordination model can fairly share the surplus profits between SC members based on their bargaining power. Arani, Vafa, H., Rabbani, M., Rafiei, H., 2016, “A revenue-sharing option contract toward coordination of supply chains”, International Journal of Production Economics, 178: 42-56. Azari Khojasteh, M., Amin-Naseri, M. R., Nakhai Kamal Abadi. I., 2013, “Price Competition between Two Leader-Follower Supply Chains, A Case Study”, International Journal of Industrial Engineering & Production Research, 24: 277-286. Bin, l., Zhang, R., Xiao, M., 2010, “Joint decision on production and pricing for online dual channel supply chain system”, Applied Mathematical Modelling, 34: 4208-4218. Boyacı, T., Gallego, G., 2002, “Coordinating pricing and inventory replenishment policies for one wholesaler and one or more geographically dispersed retailers”, International Journal of Production Economics, 77: 95-111. Cachon, G. P., 2003, “Supply chain coordination with contracts”, Handbooks in Operations Research and Management Science, 11: 227–339. Cohen, M. A., 1977, “Joint pricing and ordering policy for exponentially decaying inventory with known demand”, Naval Research Logistics Quarterly, 24: 257-268. Dumrongsiri, A., Fan, M., Jain, A., Moinzadeh, K., 2008, “A supply chain model with direct and retail channels”, European Journal of Operational Research, 187: 691-718. Dutta, P., Das, D., Schultma, F., 2016, “Design and planning of a closed-loop supply chain with three way recovery and buy-back offer”, Journal of Cleaner Production, 135: 604-619. Esmaeili, P., Rasti-Barzoki, M., Hejazi, R., 2016, “Pricing and Advertising Decisions in a Three-level Supply Chain with Nash, Stackelberg and Cooperative Games”, International Journal of Industrial Engineering & Production Research, 27: 43-59. Emmons, H., Gilbert, S. M., 1998, “Note. The role of returns policies in pricing and inventory decisions for catalogue goods”, Management science, 44: 276-283. FerhanÇebi, I., 2016, “A two stage fuzzy approach for supplier evaluation and order allocation problem with quantity discounts and lead time”, Information Sciences, 339: 143–157. Giannoccaro, I., Pontrandolfo, P., 2004, “Supply chain coordination by revenue sharing contracts”, International journal of production economics, 89:131-139. Goering, G. E., 2012, “Corporate social responsibility and marketing channel coordination”, Research in Economics, 66: 142-148. Govindan, K., Diabat, A., Popiuc, M. N., 2012, “Contract analysis: A performance measures and profit evaluation within two-echelon supply chains”, Computers & Industrial Engineering, 63: 58-74. Heydari, J., 2013, “Coordinating replenishment decisions in a two-stage supply chain by considering truckload limitation based on delay in payments,” International Journal of Systems Science, 46: 1897-1908. Heydari, J., Norouzinasab, Y., 2015, “A two-level discount model for coordinating a decentralized supply chain considering stochastic price-sensitive demand”, Journal of Industrial Engineering International, 11: 531-542. Heydari, J., Norouzinasab, Y., 2016, “Coordination of pricing, ordering, and lead time decisions in a manufacturing supply chain”, Journal of Industrial and Systems Engineering, 9: 1-16. Hojati, S., Seyedhosseini, S.M., Hosseini-Motlagh, S.M., Nematollahi, M.R., 2017, “Coordination and profit sharing in a two-level supply chain under periodic review inventory policy with delay in payments contract”, Journal of Industrial and Systems Engineering. Hsu, S.L., Lee, C.C., 2009, “Replenishment and lead time decisions in manufacturer–retailer chains”, Transportation Research Part E: Logistics and Transportation Review, 45: 398–408. Johari, M., Hosseini-Motlagh, S.M. and Nematollahi, M., 2017, “Simultaneous coordination of review period and order-up-to-level in a manufacturer-retailer chain”, Journal of Industrial and Systems Engineering, 10, pp.1-17. Li, J., Liu, L., 2006, “Supply chain coordination with quantity discount policy”, International Journal of Production Economics, 101: 89-98. Li, L., Wang, Y., Dai, W., 2016, “Coordinating supplier retailer and carrier with price discount policy”, Applied Mathematical Modelling, 40: 646–657. Mokhlesian, M., Zogordi, S.H., Nakhai Kamal Abadi, I., Albadvi, A., 2015, “Pricing decisions in a two-echelon decentralized supply chain using bi-level programming approach”, Journal of Industrial and Systems Engineering, 8: 106-124. Montgomery, D. C., Bazaraa, M. S., Keswani, A. K., 1973, “Inventory models with a mixture of backorders and lost sales”, Naval Research Logistics Quarterly, 20: 255-263. Nematollahi, M., Hosseini-Motlagh, S.M., Heydari, J., 2017a, “Coordination of social responsibility and order quantity in a two-echelon supply chain: A collaborative decision-making perspective”, International Journal of Production Economics, 184: 107-121. Nematollahi, M., Hosseini-Motlagh, S.M., Heydari, J., 2017b, “Economic and social collaborative decision-making on visit interval and service level in a two-echelon pharmaceutical supply chain”, Journal of Cleaner Production, 142: 3956-3969. Ouyang, L. Y., Chuang, B. R., 2000, “A periodic review inventory model involving variable lead time with a service level constraint”, International Journal of Systems Science, 31: 1209-1215. Panda, S., 2014, “Coordination of a socially responsible supply chain using revenue sharing contract”, Transp. Res. Part E, 67: 92–104. Panda, S., Modak, N. M., Sana, S. S., Basu, M., 2015, “Pricing and replenishment policies in dual-channel supply chain under continuous unit cost decrease”, Applied Mathematics and Computation, 256: 913-929. Rosenblatt, M. J., Lee, H. L., 1985, “Improving profitability with quantity discounts under fixed demand”, IIE Transactions, 17: 388–39. Roy, A., Sana, S. S., Chaudhuri, K., 2016, “Joint decision on EOQ and pricing strategy of a dual channel of mixed retail and e-tail comprising of single manufacturer and retailer under stochastic demand”, Computers & Industrial Engineering. Sajadieh, M.S., Akbari Jokar, M. R., 2009, “Optimizing shipment, ordering and pricing policies in a two-stage supply chain with price-sensitive demand”, Transportation Research Part E: Logistics and Transportation Review, 45: 564-571. Saha, S., 2013, “Supply chain coordination through rebate induced contracts”, Transportation Research Part E, Logistics and Transportation Review, 50: 120-137. Sana, S. S., 2011, “The stochastic EOQ model with random sales price”, Applied Mathematics and Computation, 218: 239-248. Sarmah, S.P., Acharya, D., Goyal, S.K., 2007, “Coordination profit sharing between a manufacturer a buyer with target profit under credit option”, European Journal of Operational Research, 182: 1469–1478. Sarmah, S. P., Acharya, D., Goyal. S. K., 2006, “Buyer vendor coordination models in supply chain management”, European journal of operational research, 175: 1-15. Seifbarghy, M., Nouhi, Kh., Mahmoudi, A., 2015, “Contract design in a supply chain considering price and quality dependent demand with customer segmentation”, International Journal of Production Economics 167: 108-118. SeyedEsfahani, M. M., Biazaran, M., Gharakhani, M., A, 2011, “game theoretic approach to coordinate pricing and vertical co-op advertising in manufacturer–retailer supply chains”, European Journal of Operational Research, 211: 263–273. Sinha, S., Sarmah, S. P., 2010, “Coordination and price competition in a duopoly common retailer supply chain”, Computers & Industrial Engineering, 59: 280-295. Spengler, J. J., 1950, “Vertical integration and antitrust policy”, The Journal of Political Economy, 347-352. Taleizadeh AA, Pentico, D.W., 2014, “An Economic Order Quantity model with partial backordering and all-units discount", International Journal of Production Economics, 155: 172–184. Wang, X., Liu, L., 2007, “Coordination in a retailer-led supply chain through option contract”, International Journal of Production Economics, 110: 115-127. Whitin, T. M., 1955, “Inventory control and price theory”, Management science, 2: 61-68. Xie, J.,Wei, J.C., 2009,“Coordinating advertising and pricing in a manufacturer–retailer channel”, European Journal of Operational Research, 197: 785-791. Yang, P.-Ch., 2004, “Pricing strategy for deteriorating items using quantity discount when demand is price sensitive”, European Journal of Operational Research, 157: 389-397. Zhang, Q., Luo, J., Duan, Y., 2016, “Buyer–vendor coordination for fixed lifetime product with quantity discount under finite production rate”, International Journal of Systems Science 47: 821-834.